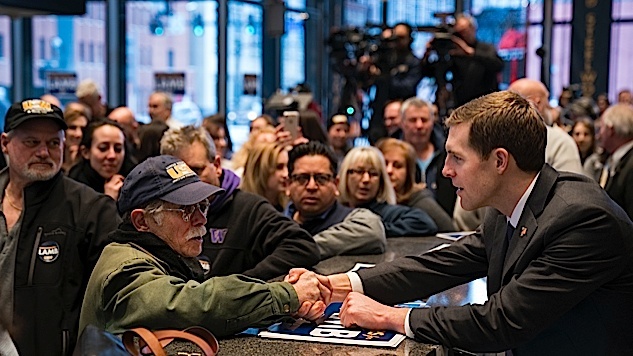 Pending the tally of a few uncounted absentee ballots and a probable recount (which may include the usual legal shenanigans), it looks very much like Democrat Conor Lamb will defeat Republican Rick Saccone in the PA-18 special House election. As you no doubt heard if you followed the drama on cable news, this stunning victory came in a red district where Trump won the presidential race in 2016 by almost 20 points. It’s the latest disastrous result for a Republican party that has suffered a string of shocking defeats in the past year, and there’s really no way to make a silk purse out of this pig’s ear. Oh, but they tried. One of the funniest attempts at narrative spin came from the right-leaning talking heads on CNN and MSNBC (and, I assume, the entire cast of Fox News), who kept pushing the idea that even if Saccone lost, there was a so-called “Trump bump” that closed the gap from five points to a dead heat in the final days. This alleged late flurry was meant to be the inspiring result of tweets, robo-calls, a Trump rally in the state, and an appearance from his idiot son with Saccone at a chocolate store on Monday. Along with being laughably unprovable, this story ignores the much larger, much more irrefutable truth: Republicans blew a 20-point lead in the district! And Rick Saccone was not Roy Moore—there was nothing egregious or offensive about him. The worst that could be said is that he kinda sucked at fundraising, but the RNC more than bailed him out on that front. So what explains the dramatic swing? It’s Trump! There’s no other logical reason for what happened in Pennsylvania—people are extremely pissed off at Donald Trump’s presidency, and Lamb’s victory is a referendum on the job he’s done as president in the 16 months since they turned out for him in force and elevated him to the country’s highest office. And it’s completely predictable, too. Trump got them fired up about god knows what—there’s probably a different inspiration for every voter, and all the usual explanations apply, from “economic anxiety” to outrage at the federal government to racial resentment to hatred for Hillary Clinton to our innate national admiration for an unrepentant conman. But that kind of thing only goes so far. It’s satisfying to pull that lever, to snub your nose at whatever authority you think is keeping you down, and to laugh as the sensible world shudders in fear at the prospect of a mad narcissist in the oval office. That’s called making your point. In the aftermath, though, all but the most adamant zealots will have to notice what’s actually going on today. A few details may escape their attention—they may not notice the steady repeal of any environmental protections, for instance—but the cumulative effect of damaging policies and embarrassing, impulsive behavior can’t help but catch their eye. And there are a lot of zealots, by the way, and that’s a scary thing for liberals, because the anecdotal evidence can make it seem like we live in a country that has lost its mind and enjoys racing headlong to the abyss. But there are a lot of non-zealots who chose Trump in November 2016, and even if they still hate liberals and think Hillary Clinton should be in prison, those people are not interested in destroying the country. Which is what lies at the heart of the Trump administration and the Republican power structure in general—the destructive impulse that seeks to enrich a small group of people and their affiliated corporations at the expense of everyone and everything else. That “everything” matters, because this goes beyond just people and into the degradation of an entire society. There were some voters who threw caution to the wind, maybe even against their better judgment, but now they’re being forced to see the vision of what America would look like if unchecked Trumpism and Republicanism won the day. It might as well be an apocalypse. In short, our president and our Republican congress have aroused a national instinct for self-preservation. And when that impulse is triggered, it’s an overriding one—in the short-term, at least, it will blot out the differences between progressives, centrist Democrats, neoliberals, and moderate Republicans. There’s a wave coming in 2018, and it’s not exclusively green or blue or purple, and it’s not the exclusive province of those who hated Trump in the first place—it’s a wave whose primary purpose is washing out a destructive force. The more pernicious that force looks, and the more blatant its tactics, the stronger the self-preserving instinct becomes. This is why Republicans are quitting in droves, by the way—they can read the writing on the wall, they know the jig is up, and they’re hitting the eject button now because getting paid is better than losing. It’s why Doug Jones won in Alabama, and why the one-year anniversary of Trump’s win was such a disaster for his party. You can fool a lot of people, for a very long time, but when you finally back them into a corner and show them a picture of their death, the claws will come out.